Sometimes progress can be messy! 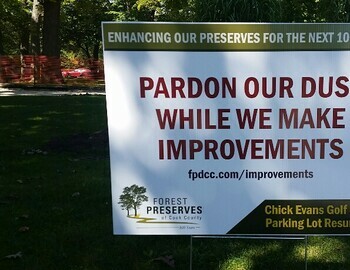 This week marks the start to the re-asphalting of the Chick Evans parking lot. This work is highly anticipated and we look forward to the finished product. In the meantime, this work will cause some areas of the parking lot to be off-limits. This week work begins on the small lot behind the maintenance building, the handicap parking spots, and the walkway to the north entry. Next week will mark the closure of the northwest section of the lot. This will result in many parking spots being closed, so plan accordingly. We recommend showing up early and/or carpooling if possible. Finally, the northeast lot section as well as the wrap-around area in front of the pro shop will be upgraded. This will result in the golf carts being staged elsewhere. We appreciate your patience as we all look forward to the completion of this exciting project!